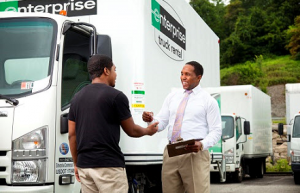 Spotlight on Service: Account Specialist Chad W.
Spotlight on Service: Enterprise Branch Manager Cecilia C.
Enterprise Truck Rental Account Specialist Chad W. knows that it’s the little things that can make someone’s day. Case in point, he recently went above and beyond for a customer who had lost a very special item, and the customer wrote a letter of thanks for his help. Read on to learn more about Chad’s story, and his advice for providing great customer service every day. Q: How long have you worked for Enterprise? A: All together, I’ve been with the company for three years. I spent a little more than two years working in Fleet Management before I joined Truck Rental in Pittsburgh, Pennsylvania almost a year ago. Q: Tell me about this particular customer. A: The customer had rented one of our pickup trucks to help with his family’s move into their new home. Two days after returning the truck, he left a message after hours asking if anyone had come across a watch. He explained he hadn’t been able to find the watch since moving, and the only place he hadn’t checked was inside the truck he had used for moving. He said his wife had given him the watch on their wedding day, which explained why he was so frantic about losing it. Q: What did you do to help? As soon as I heard the message from the customer, I made it a priority to find the watch. I immediately went to the lot to search through the truck he rented only to discover that it had already been rented out to another customer. I went to speak with one of my colleagues Justin W. Fortunately, Justin knew right away what I was talking about. He found the watch while cleaning the rental and had tucked it away in a safe place. I was thrilled to call my customer with the good news. Q: What do you do to exceed customers’ expectations? A: I listen. It’s a simple concept, but by listening to a customer’s wants and needs I’m often able to deliver what that person is looking for while providing great service. Q: What advice can you give others about providing exceptional service? A: Be helpful and courteous to your customers. Management always talks about how providing quality customer service can go a long way to benefit a branch, so going the extra mile to make customers happy sounds like the simplest way to earn success.